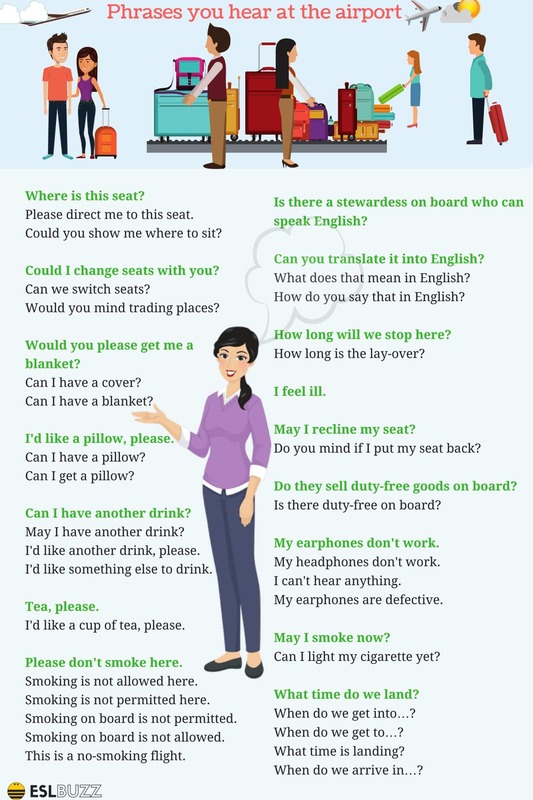 Learn common phrases you hear at the airport. After this lesson, you will be completely prepared to handle any situation in airports and airplanes with patience, intelligence and a smile. 5. Flight BC767 is now boarding. 6. Flight IA443 has been cancelled. 7. Flight DAN119 has been delayed. 10. …Please make your way to Gate 20. Would you like a window seat or an aisle/corridor seat? Your flight leaves from gate 20. There is no smoking on this plane. Please turn off electronic devices. Plave you luggage in the overhead compartments. Excuse me, where is baggage claim? Could you tell me where customs is? Do you know where Terminal B is? How do you get to Gate E?